In up-and-coming Leyton Road E15, Prospect East is the first phase of a major new integrated neighbourhood in Stratford, imaginatively arranged around a central landscape design garden, with incorporated community space. The landmark development comprises a contemporary collection of apartments, duplexes, penthouses and houses, available for private sale and shared ownership. Ideal for first time buyers, the homes offer flexible living, with high-quality interiors, alongside outdoor space in the form of a balcony, terrace, or winter garden. 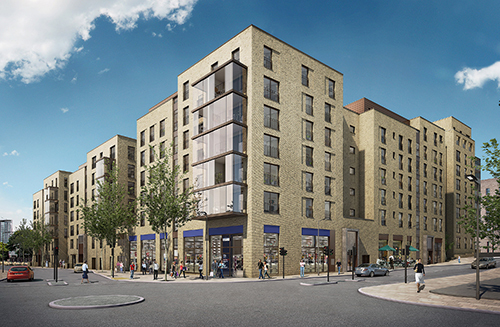 For purchasers who are keen to live in a well-connected London location, Prospect East offers unrivalled affordability. Prices for a one bedroom apartment started from as little as £105,000 for a 30% share. Located against the backdrop of the Olympic Stadium and East Village, the development provides affordable and well-designed homes, in an area in which the Olympic legacy continues to create a distinct and inspiring atmosphere.